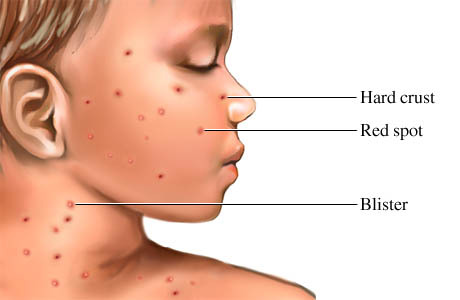 If you have questions such us: What are the symptoms of chickenpox? What are the possible complications? What is the treatment for chickenpox? Is chickenpox infectious? Is there a vaccine against chickenpox? Should I let my child catch chickenpox? please read this article. Chickenpox (or chicken pox) - is a highly contagious illness caused by primary infection with varicella zoster virus (VZV). It usually starts with vesicular skin rash mainly on the body and head rather than at the periphery and becomes itchy, raw pockmarks, which mostly heal without scarring. On examination, the observer typically finds lesions at various stages of healing. Chickenpox is an airborne disease spread easily through coughing or sneezing of ill individuals or through direct contact with secretions from the rash. 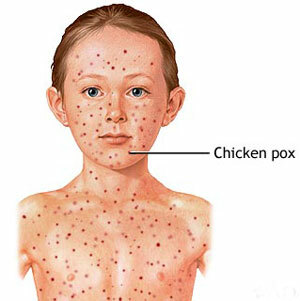 A person with chickenpox is infectious one to two days before the rash appears. They remain contagious until all lesions have crusted over (this takes approximately six days). Immunocompromised patients are contagious during the entire period as new lesions keep appearing. Crusted lesions are not contagious. Fever (temperature), aches and headache often start a day or so before a rash appears. 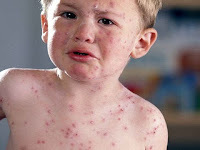 The spread of chickenpox can be prevented by isolating affected individuals. Contagion is by exposure to respiratory droplets, or direct contact with lesions, within a period lasting from three days prior to the onset of the rash, to four days after the onset of the rash. The chickenpox virus (VZV) is susceptible to disinfectants, notably chlorine bleach (i.e., sodium hypochlorite). Also, like all enveloped viruses, VZV is sensitive to desiccation, heat and detergents. Therefore these viruses are relatively easy to kill. Some countries require the varicella vaccination or an exemption before entering elementary school. Protection from one dose is not lifelong and a second dose is necessary five years after the initial immunization, which is currently part of the routine immunization schedule . The chickenpox vaccine is not part of the routine childhood vaccination schedule in the UK. In the UK, the vaccine is currently only offered to people who are particularly vulnerable to chickenpox. A person who already took the vaccine is more likely to have only a few chickenpox.